Where can I find the TPM updater that was previously on the Razer Website? With some models of the Razer Blade, users experienced issues when using the updater and were unable to successfully complete the update. Razer engineers are currently working on an updated version of the updater. Please stay tuned for the updated version that will be released on the website as soon as it is available. How do I replace the battery in my Razer Blade Laptop? Razer Blade batteries should be replaced by an authorized Razer Repair Center. Should you feel your battery is defective and needs replacing, please contact the Razer Support team here and we will be happy to assist you. My computer system became unstable after I installed Comodo Internet Security / Comodo Firewall. I can no longer click while holding down a letter on my keyboard. The warranty length for the Razer Blade 2016 is 1 year. Please see full details for warranty lengths: here. Does the 14" Blade Support Intel WiDi? WiDi is not supported, as this technology isn't meant for gaming. Does the 14" Razer Blade Support 3D? Does the 14" Razer Blade Support Miracast? Does my Razer Blade (14") come with virus protection? The Windows 8 operating system package includes Microsoft Security essentials. Does the Razer Blade (14") come with bloatware? Razer understands how important it is to keep a bloatware free environment on your brand new Razer Blade. The Razer Blade comes with no bloatware preinstalled. Does the Razer Blade (14") feature a system recovery mode? Yes, system recovery is achieved simply by pressing the F9 key when booting your system. A Blade Recovery Stick is also available for purchase to restore your Razer Blade to its factory default state. Does the Razer Blade (14") support NVIDIA 3DTV Play? In lieu of longer battery life this feature is not available on the Blade. This is tied into the NVIDIA® Optimus™ technology for better performance and extended battery life. Does the Razer Blade (14") Solid State Drive (SSD) support TRIM? Yes, the Razer Blade's SSD supports TRIM. TRIM optimizes performance and prolongs the life of your SSD. How can I contact Razer Support if I'm having problems with my Razer Blade (14")? 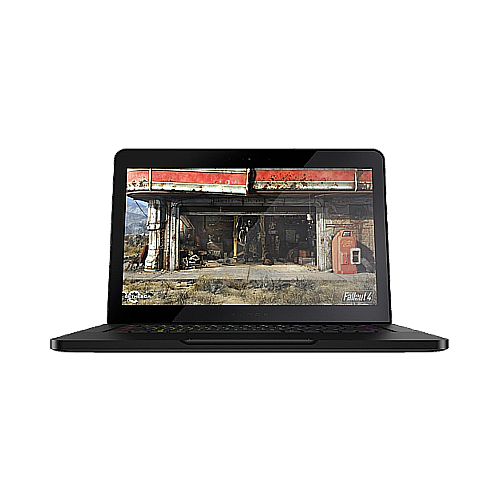 The Razer Blade features two graphics processors (Intel HD graphics and NVIDIA GTX 970M Graphics). If you would like optimal performance be sure to set your program to utilize the NVIDIA GTX 970M graphics processor. Most modems have and indicator that shows if it is connected to the internet, check if your modem is connected to the internet. If your modem does indicate that you are connected to the internet, try restarting your modem. If you're still have issues please contact your local internet provider to ensure that the connection is stable. If you still have problems connecting, please contact Razer Blade Technical Support. The front Led indicator shines on only when the lid is closed. The power button indicator shines on when the lid is open. Synapse 2.0 will continue to function even if your internet disconnects as long as you check the "Stay Logged In" box on the login screen. Razer strongly advises all users to stay logged in. When my Blade comes out of the sleep or standby mode, the track pad does not work. How can I fix this? Why doesn't my Razer Blade have an optical drive? How can I install applications without an optical drive? As digital downloads have become the standard, Razer eliminated the optical drive to make the Razer Blade even thinner. You can purchase an external, USB-based optical drive to pair with the Razer Blade. Razer Systems must be repaired at an Authorized Service Center, please contact us at 1-855-872-5233 to arrange for repairs.